Note: Please still refer to the information below which describes the functionality of version 1, most of which still applies to v2. 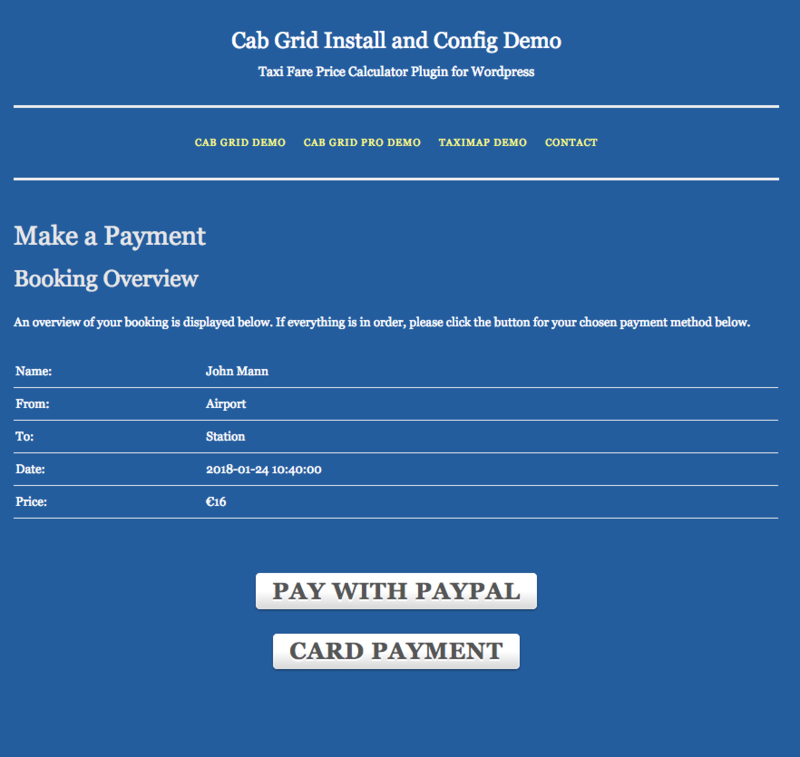 The Booking Management add-on for Cab Grid Pro adds online booking management to the Cab Grid Pro WordPress plugin. This means that bookings are stored in the WordPress database and can be processed (accepted, declined, cancelled, deleted, etc.) from the WordPress admin section of your website. This Add-on is now available to try via our back-end demo and buy for your website. Click CHOOSE FILE or BROWSE. A file browser window will open. Navigate to the folder containing the Booking Management Add-on ZIP file and click it to select it. Click OPEN or CHOOSE to select the file. The file browser will close and the file name will appear in the file field. Click INSTALL NOW to upload the ZIP file. Click ACTIVATE PLUGIN to activate it. A new BOOKINGS item will appear as a tab on the Cab Grid Pro admin page or as a sub-menu item in the main Cab Grid Pro menu (on the left). Settings & bookings will appear in this tab. With this add-on enabled any new bookings will be stored in the WordPress database. Email notifications will still be sent as set in Cab Grid OPTIONS. If a payment is completed via either Paypal or the Stripe Integration Add-on, this will be recorded against the booking in the WordPress database. The list of bookings is shown when clicking either the ‘Bookings’ tab on the Cab Grid Pro admin page or by clicking the ‘Bookings’ menu item under the main Cab Grid Pro menu in the WordPress admin section. The right column of each booking displays a set of action buttons. Which buttons are displayed depends on the status of the booking. The terms ‘ACCEPT’ and ‘CONFIRM’ are interchangeable here and are taken to mean the same thing: confirming or accepting the booking request. Full details of the booking including any custom form field and extras can be viewed in a separate window by clicking DETAILS. These are formatted to be printed and there is a PRINT button at the bottom. Within the booking table itself, supplementary details are shown as the mouse hovers over certain cells. These include status, payment info, address info, and modification dates, amongst others. The customer can be contacted directly via email or telephone. Clicking the customer’s name will open a new email addressed to them. Clicking the phone number will initiate a telephone call (if the device/browser supports calling). For CONFIRM, DECLINE and CANCEL action buttons a custom message can be entered that will be sent to the customer along with the relevant message. Optionally, the confirmation email can generate a link to a payment page on your site where the customer can make a payment via Paypal, Stripe (if the Stripe add-on is installed), or both. To enable this, tick the box above the custom message field labelled, “ Include a payment link“. The link will be included below the custom message. 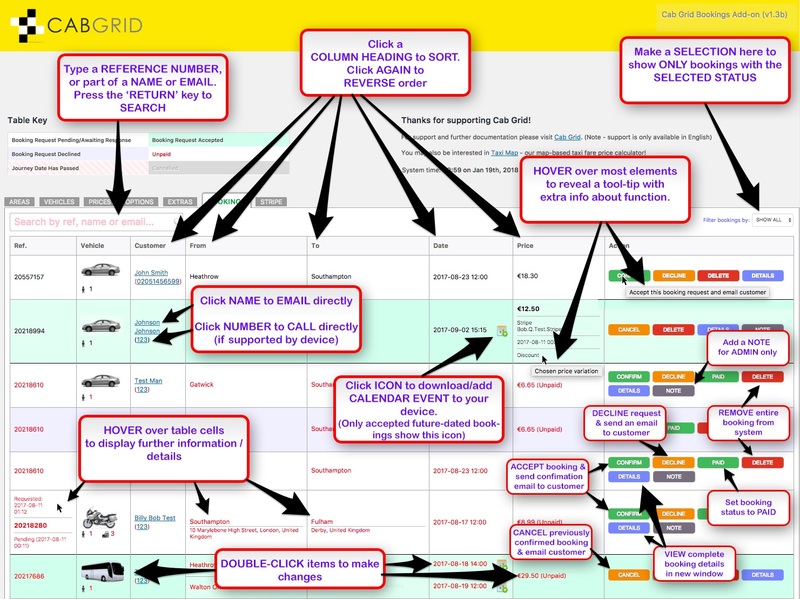 On the Cab Grid Bookings page/tab, booking requests can be sorted by clicking column headings. The list will then be sorted by that column. Clicking the same column again will reverse the order. The ‘Filter by‘ drop down menu allows only bookings with the selected status to be displayed. This is useful if only pending requests or accepted bookings should be shown. Pressing the Return (or Enter) key submits the search text and returns results. A CONFIRMED and PAID booking will offer an ‘Add to Calendar’ link icon displayed in the Pickup Date column. Clicking this link will download a calendar event file (.ICS). This can be added to a device calendar. Hand-held devices will often add events automatically. From version 1.4 of the Booking Management Add-on, it is possible to export taxi booking data as CSV (comma separated) file. CSV files can be opened or imported to common software such as Microsoft Excel. Insure all the bookings to export are in view on the BOOKINGS page. Optionally, use the filter or search function to limit the bookings displayed. Use the ‘records in page‘ links at the bottom to show ALL if necessary. Click OK in the confirmation dialogue if ok to continue. You will be prompted to download the CSV file to your computer. Bookings are stored in a table in your WordPress database. This means they can easily be backed up by backing up your WordPress database. There are various plugins available that can do this. It is possible to process a group of bookings in one go. When this is done, the same supplementary message will be sent to each of the selected customers. However, if the payment link option is selected, each customer will receive their own dedicated link. To use this feature a group of bookings must be selected. This can be done either by clicking the SELECT box next to each booking, or using the SELECT ALL button at the top of the table. The SELECT ALL function will select all bookings currently displayed, thus it is advisable to search or filter bookings and insure all matching books are in view by selecting ‘ALL’ by ‘Bookings per page:’ at the bottom of the booking table. Once the required group of bookings is selected, choose the action from the ‘With Selected‘ drop-down menu at the top of the booking table. You will be asked to confirm your choice before the action is started. You can ACCEPT (CONFIRM), DECLINE, CANCEL, DELETE or EXPORT. 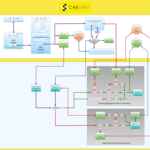 Please also refer to the Cab Grid Booking Management Add-on version 2+ documentation. In my company sometimes passengers like to book by phone. Is there any way to insert new bookings manually from the back-end? We have released version 2.0 of the Cab Grid Booking Management Add-on which now allows for bookings to be ADDED, fully EDITED, and DUPLICATED from the back-end (WordPress admin). Longer answer: There isn’t much that would be different in adding a booking in the back-end than adding it on behalf of the customer via the plugin on the front-end. Thus, development of this feature seems unnecessary at this time. However, I can see that you may not want some of the actions triggered on the front-end (such as email notifications) if the customer has called the booking in by phone. I really like Raul’s suggestion. Now we are doing it from the front page as if we were the customer, but it was just a suggestion. Hi, is it possible to automatically set accept for all bookings. I would like that my customers can finish all (booking and payment) on web without waiting for my action. For example, you could use the ‘BOOKING SENT MESSAGE’ (under OPTIONS tab in Cab Grid Pro) to state, “Paid bookings are scheduled immediately.” You could also use the ‘EMAIL ACKNOWLEDGEMENT MESSAGE’ to give customers further details. However, in many cases our users prefer to verify availability and respond to the booking request to confirm the booking. This can be done simply by replying to the booking email. This is essentially what the Booking Management Add-on does as well. Check out this article: Managing taxi booking requests to explore how the process might work for you.